We do get sent some awesome toys to review here at Baby Budgeting but this without doubt has been one of the very best. We love it! 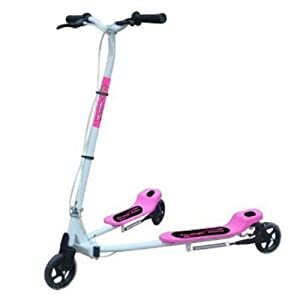 The Vtriker Elite from Vtriker is what I would call a scissor scooter. That’s not as technical term just Beckyspeak! It’s also what I would call a right work out! The Vtriker has been around for awhile but now the new Vtriker Elite has now been launched amazingly at £20 cheaper than the first generation Vtriker. The Vtriker Elite is a great way for kids (and mums) to be active while having fun! With the Vtriker Elite you use body movement to get it moving so fabulously this is a battery free toy! The Vtriker Elite is a new product to the market and one which is destined to be hugely popular. I love toys that encourage my kids to be active. To make this move all you have to do is simply push your feet in and outwards whilst you stand on the platforms and off you go. It does require some effort though! It is suitable for kids age 7 + but my little 8 year old did find it quite a lot of work. The Vtriker Elite costs £69.99 and comes in four colours. Black, blue, green and pink. It’s a rather fabulous toy. It’ll make your kids smile and it will make them tired (two good things !) I have to confess I have played on it a fair few times myself. The neighbours have had a field day watching me but you know what I don’t care. It’s been fun!